I love the Grinch! I seriously, must watch this movie 10 times each holiday season. Then there are those few times during the year I just need my "fix"! But let's get to the real questions....lollipops or suckers? Lollipops to me, but suckers to most where I grew up. It is funny how all of these regional things never seem to occur to you until you move to a new region. It has been a heck of a week. I made these 4 days ago, and never got them shared with you until now. So sorry but, the truth is, I have 2 crying grandbabies in the other room so we need to make this a quickie! I think these would be awesome added to your holiday cookie trays and thanks Yolli Ltd. for these cute lollipop sticks! They have everything you need for all things sweet in your life! These are made from Jolly Ranchers candy. You must use the hard candy, not the soft chews!! I went to a party store where I could get all red and green but heck, use all the colors if you want! You will need, but the quantities are really up to you! Preheat your oven to 250 degrees F. Place your unwrapped candy however you want them to melt. Make sure they are touching, I used different patterns, but I use 2 or 3 for each one. I think that makes a decent size who-pop! Place into oven (WITHOUT THE STICKS) for 5-6 minutes. They will have melted together to touch, when you get them out, immediately take your stick and sort of roll it into the middle so it is all covered with the candy. If you are using a flat stick, you can actually lay them down on the parchment and put the hard candy on them and let them melt right onto the stick. 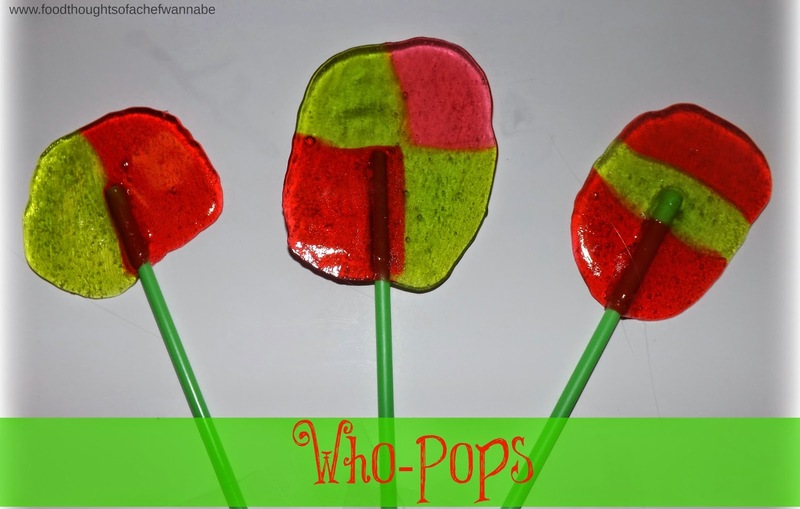 Let cool 15 minutes and wham, bam, thank you WHOVILLE for these adorable pops!